Access to responsible finance is an important tool for strengthening the economic security of poor and low-income families. Access to non-financial goods—like clean energy products—are also critical for improving health and wellbeing, increasing productivity and alleviating poverty. BrightLife, a social enterprise by FINCA, pairs access to finance with access to energy to unlock productivity and wellbeing for the poor. It is also building pathways to financial inclusion for the unbanked. Globally, nearly 1 billion people have no electricity. In Uganda, 73 percent of the population is without access. People are forced to burn kerosene, wood and charcoal to meet their lighting and energy needs. These inefficient fuels lead to indoor air pollution that causes 2.6 million premature deaths worldwide each year, plus threats like house fires and burns. Off-grid living also stifles productivity, hinders earning potential and increases household energy expenditures. Nearly 300 million kids cannot study after sunset, leaving them academically disadvantaged. Countless businesses are forced to shutter at sundown, reducing available working hours. And poorer households reliant on traditional fuels spend a relatively larger share of their total expenditure on energy. All together, these factors perpetuate a vicious cycle of poverty. Together, we can change this. Today, there are innovative, entrepreneurial solutions to poverty that aim to bring basic services to poor families and their communities. The key becomes how to provide access to quality and affordable products to markets deemed difficult to reach (rural) and uneconomical to serve (low-income). Recognizing the power of the FINCA global microfinance network, we saw that we had a role to play in accelerating solutions. This led FINCA to establish BrightLife, a social enterprise in Uganda that provides last-mile distribution and end-user financing for products that create healthier and safer homes, increase productivity, reduce household expenses and provide additional income-generating opportunities. Leveraging the connection with FINCA Uganda, a local microfinance institution, to build customer trust. Promoting awareness and education of clean energy products among off-grid and underserved populations. Supporting access to affordable, life-changing products through or pay-as-you-go (PAYGo) financing, or monthly payment plans. Distributing high-quality clean energy products that are backed by warranties down to the last mile. Providing client training on product use and maintenance, including after-sales support. Conducting market research on clients’ product experience to share with manufacturers as part of research and development. 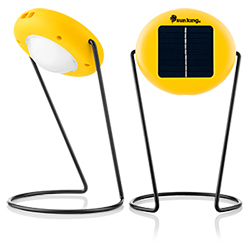 Solar lanterns are small and portable lights that may be hand-held, hung or placed on a table top. BrightLife offers a solar lantern that provides 72 hours of high-power light after a single day of charge. Another model even includes two USB ports for charging mobile phones. BrightLife customers tell us they use these in their businesses to extend the working day, thanks to the products’ small, portable design. 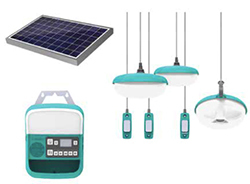 A range of solar lighting and power systems are available to BrightLife customers. 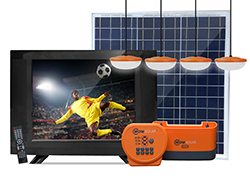 Solar home systems offer three or more lights and charge mobile phones. Some models include a radio and even a TV. Additional lights and appliances may be added over time without the need to purchase a new system. For increased productivity, BrightLife customers can add solar-powered appliances to the system they already own. Appliances will soon expand beyond TVs to include water pumps, maize grinders and ice-makers. Each of these appliances is designed to be income-generating, which will offset product costs within the first year. 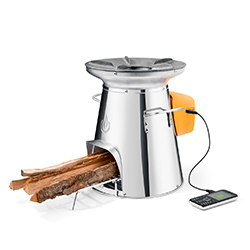 BrightLife offers modern and innovative firewood and charcoal cookstoves. These products cuts toxic emissions by up to 90 percent and reduces fuel use by 50 percent or more. One clean cookstove in particular uses the heat from cooking to generate enough energy to charge a mobile phone or power an LED light. BrightLife is closely integrated with FINCA’s microfinance work. By using customer payment histories from PAYGo, BrightLife can build credit profiles for unbanked populations. This allows BrightLife to link its customers to a broader set of financial products and services at FINCA Uganda. In doing so, we are building a bridge between energy access and financial inclusion. BrightLife has committed to the GOGLA Consumer Protection Code’s six principles of business practice. This demonstrates our willingness as an organization to provide consumer protection and practice high standards as a business, but our code of conduct has not yet been measured or certified. Throughout 2019 we will be working with GOGLA to measure, demonstrate and improve our practice ahead of formal recognition by 2020. Further information can be found on the GOGLA website. BrightLife represents a unique, exciting opportunity to drive lasting social impact. FINCA is looking for forward thinking partners committed to market-based solutions to poverty to make significant financial contributions for BrightLife. Your support will help subsidize product cost, fund product training, and enable product and network expansion.